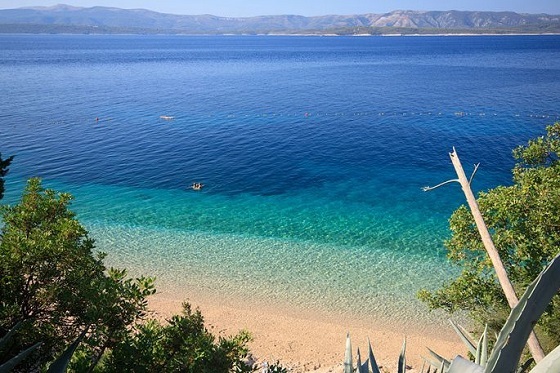 More international recognition of the beach heaven that is Central Dalmatia, as two of the region’s beaches feature in the 2019 list of top 40 beaches from The Guardian! The island of Šolta hides in plain sight: it’s a short ferry ride from Split, yet it receives only a fraction of the visitors that head to big-hitting neighbours Hvar and Brač. Tucked into its western end is the fishing village of Maslinica, with a smart little marina and a cute, pebbly beach at the mouth of the harbour. It’s big enough for a beach cafe, kayak rental and a few sunloungers, but still has an intimate village feel. And its western aspect means extraordinary sunsets. Just beyond the beach is an archipelago of seven small islands, which can be explored via kayak or boat. Just a few kilometres west of Croatia’s most recognisable beach, the V-shaped Zlatni Rat, there’s a much quieter scene at Murvica beach. Take the path from Murvica village down the hill past olive groves and vineyards to the shingle beach backed by fragrant pines. There are no crowds or neat rows of sunloungers here, just a rustic beach cafe, views of the island of Hvar and clear blue-green water.